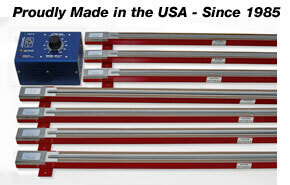 After months of developing and testing, FTM is pleased to announce the NEW 10 Foot Strip-Heater model FS-120. This longer length brought many design challenges from the manufacturing of the steel housing, element design, and the physics of heat expansion, it proved no easy task. Perhaps, it's only our stubborn nature that got us to the finish line. Why such a long length? Starting back in 1985, with plastic fabrication in mind, FTM designed and manufactured the first strip heaters of this kind. Over the years FTM's line of heaters has grown to meet, not only the needs of the fabrication industry but industries we could not have imaged at the time. These new industries have brought with them the need for a heater longer than the eight foot model (FS-96) FTM has produced since the beginning. So, whether you're fabricating acrylic displays, building cabinetry or installing bathtub surrounds, and in need of a heater from 2 foot to 10 foot, we have you covered. All free standing heaters can be used with the AEC15 power control. Our Heating Trays have been exclusively designed to give constant professional bends while working with all types of thermoplastic materials, Acrylic, PVC, CPVC, Polypropylene, Polycarbonate, and more. These heaters are ideal for straight line bends or folds and capable of heating material up to 1/2" thick. NEW FS-120 10 FOOT HEATER! FS-120 ships by freight line in a wood crate. Freight quotes available. *Special offer introductory price, limited time offer.